Hon (真 - meaning "true" or "real") maguro, or bluefin tuna, is a very large fish, with some specimens weighing more than eight hundred pounds. 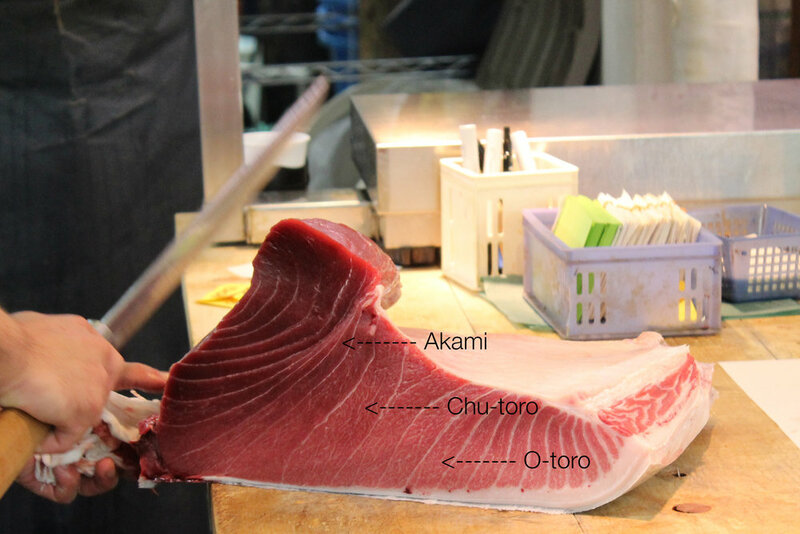 Because it is so large, different cuts of the fish have different flavors and appearances, and different names: a lean cut, red in appearance, is called akami, a moderately fatty cut is called chu-toro, and a very fatty cut, lighter in color and showing some marbling, is called o-toro. The very best tuna comes from the waters of the Tsugaru Straight off the coast of Oma in northeastern Aomori and fetches very high prices. Because of its scarcity, a shop's ability to regularly secure Oma tuna is an indicator or the shop's status in the sushi hierarchy. Tuna was not always a prized catch in Japan, as a matter of fact it was considered a throwaway fish during much of the Edo period. Akami wasn't popular until the 1800's, and toro didn't gain popularity as a sushi neta until well into the twentieth century, partially due to technological advancements in refrigeration. Yoshino Sushi Honten in Nihonbashi (tabelog link) was the first sushiya to regularly serve toro sushi in the 1920's or 30's. Before then, toro was thrown away or used as cat food! It wasn't until the 1960's - when refrigeration had become widespread - that tuna really caught on in Japan. Akami is often served raw or using the more traditional zuké marinade preparation, while toro is almost always served raw (although some shops do offer it aburi). Regardless of the cut, tuna is typically aged for a few days or more to allow for the meat to develop its best characteristics, including wonderful umami flavors.